I hate the smell of hospitals. It’s a horrible combination of death, and some sort of unnatural cleaner they use to cover it up. Ben Gibbard had it right when he compared the smell to piss and 409. Everything smells. The bed sheets, the chairs, the floor. So I guess in my mind that’s the smell I think of when I remember looking down at the jaundice face of my Grandpa as he lay dying in the hospital. He was a smoker most of his life. He had just gone through a quadruple bypass surgery. He was plagued with emphysema and gout. Interesting to think he didn’t die from these things. It was some sort of infection in his intestines that finally got him. It was a cold cloudy day in November. All the leaves had fallen off the trees. I remember chicken strips in the cafeteria and a Lipton green tea. The nurses said they were going to take him off the machines because there was nothing more they could do. My family gathered around his bed in a circle of chairs with the preacher standing in the corner. It was dark outside, and an intense quiet filled the room. “It’s done,” said one of the nurses after his heart had stopped. I looked at my Grandma. They had been married over fifty years. Behind her glasses, her eyes were filling with tears. I looked back at the face of my Grandpa. His yellow cheeks were more slender since arriving at the hospital. He looked peaceful. Like he would open his eyes and look at us, just like he used to do after taking a nap in his big chair. Most of my family was crying now. His death seemed so final. It was murky, hazy, and hopeless. It felt like the world should have stopped, like everyone should have known he was dead. He was dead. His heart had stopped. He was dead. He was getting colder by the minute. He was dead. My Grandpa would never again ask me what I learned in school that week. He would never grab my CD player and give it a listen. He would never be at my basketball games, my graduation, my wedding. It seems so selfish now. I stood before the open casket on the day of the funeral. The makeup had been caked onto his face to cover up the yellow. Even his hands had makeup on them. My Father told me to reach out and touch his dead body. I did. He was cold. 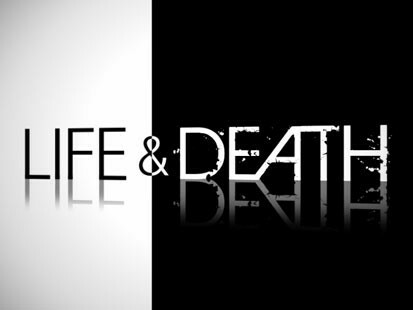 It’s amazing how many people think that death is a natural part of life. Everything I remember about my Grandpa's death was so unnatural: the color of his face, the finality, the sadness. The surgery had gone well. He was supposed to recover. There was a lot of hope that he would. But he didn’t. Everything was contrary to how it was supposed to be. How can death be natural, when everything about it literally reeks of unnaturalness? Eternity has been placed in each of our hearts, yet we cannot attain it in this life. We try, but death is inescapable. We know something is horribly wrong with our world. We can feel it in our souls when we see injustice, genocide, and brutality… when we see death. We try to cover it up. We even cake makeup on our dead family members to cover up the truth. Is it the unknown that we fear, as if walking through a dark and mysterious house, not knowing what is around the corner? Why would we fear that, unless we believed that something terrifying was waiting for us there? Something terrifying does lie around the corner. God’s judgment. I think every person on earth fears God’s judgment. What else would make death such a fearful thing? The sanctuary was fuller than I had ever seen it before. I was at the Funeral of a woman from our Church who had died from cancer. The preacher spoke a beautiful message about Christ’s steadfastness, and the Holy Spirit’s work in her up to the end. He said that he would not eulogize a woman, but rather exalt Christ. His steadfast Spirit had kept her firm to the end. She had no fear in death, and thus faced the end of her life as naturally as she could have. The end was simply a continuation into eternity. An eternity with Christ. The way it was supposed to be from the beginning. It is human to hope. I have heard people say that Christians hope and believe in Jesus because we need someone or something to cover up the guilt we feel. And they are right! We do need someone to take away our guilt. But our faith in Christ does more than take away a guilty feeling. It takes away the root of the problem. It takes away God’s wrath toward us. Why would we feel guilty, unless we felt like we had wronged someone? There are reasons for the way we feel. Jesus takes away our sin and guilt and places our hope in the right context. Christianity places everything in the right context. It makes everything make sense. It answers the deepest longings of the human soul. It makes the wise foolish, and makes the foolish wise. It evens the playing field between rich and poor, male and female, black and white. Christianity takes salvation out of our hands and places it solely in the hands of God. We cannot save ourselves. We can only cling to Christ and his righteousness. We can be confident of God’s grace in Jesus Christ alone. Not in our own working, not through our own doing. If we had to be confident in ourselves, we would certainly fear death. Praise God that we can rely on his son! How could Paul say that to die is gain (Phil. 1:21)? It’s because for Paul, to live was Christ. Looking forward to our promised inheritance, Christians no longer have anything to fear. Nothing can separate us from the love of God in Christ Jesus (Romans 8:39). Looking back on the funeral of the woman from my Church, there is no other explanation for her peace in death. The Spirit was working the knowledge of Christ’s love into her heart, like he had for many years. She was not tricking herself into believing that God loved her, or that God existed. She was too comforted for that to be the case. Humans are weak. We falter, and second guess. This woman didn’t. She faced death without fear. She faced death in the most natural way possible, being filled with the Spirit. My Grandpa was ready to die. He had been in church since he was a young boy. His prayers had become more heartfelt in the latter years of his life. I believe I will see him again, either in heaven, or when Christ comes back. Christians have something the world cannot sell. We have eternal security through Jesus Christ, our Lord. No guilt in life, no fear in death.